By now, you may have heard that Hatsumi Sensei is using the analogy this year (2015) of a skipping stone to convey aspects of his martial art movement to us, his students. It is a wonderfully poetic expression to help us understand a very natural occurrence. 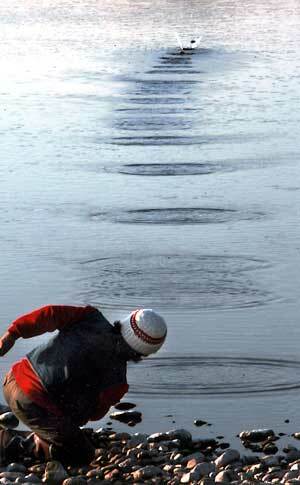 When you skip a stone across water, it naturally skips across the surface in an easy natural way. According to the contact with the surface of the water, any waves, wind, etc., it moves naturally and freely to the next point of contact until it`s momentum is exhausted. The stone is free and moving without attachment to a particular point on the water. Imagine if the stone got attached to a certain point and said, `I like this spot. I think I will stop here.`. It would sink itself. It would find itself drowning all to soon. But all too often as martial artists, we find ourselves attached to a certain technique or idea, even ideas of what martial arts are or are not! By getting caught up in fixed ideas or techniques, we often find ourselves struggling, trying desperately to tread water with the weight of our ideas and techniques pulling us down into the dark depths. There is a Gokui (inner secret) that Sensei shared with us. When you are bogged down with no chance, only by throwing ourselves away (sutemi 捨て身）will a new tide rise and carry us along. This is a teaching worth reading over several times. Like they say in Japan about dried squid, the more you chew it the more flavorful it becomes! In terms of Taijutsu (body movement art), the skipping stone gives us a nice image of moving naturally from one position to the next without getting stuck physically or mentally on a certain point or technique. As well, it asks us to move in a fluid connected way based on the movement of the opponent or uke. Based on the movement of the uke is very important. The movement of the uke helps determine and even dictates our next shift. Like the condition of the water and the wind help determine the next point of contact of the stone. Trying to do a certain movement without regard to the opponent`s movement, can be disastrous! The stone skips naturally from point to point. So should we, as martial artists, move without greed or intent of a determined outcome, naturally from point to point as lead by the movement of uke. We must learn how and when to let go, release, and move to the next natural space. Learning to let go is of utmost importance to the martial artist. Hatsumi Sensei wrote a beautiful kakejiku (hanging scroll) for a student and friend of mine. (Alan-the Malteze falcon) It reads 飛石神道。Flying Stone Divine Path. The character Kami (神) can be interpreted many ways. Divine, Nature, Godly etc. If you recall the saying from Shinden Fudo Ryu `Ultimate Nature`(自然至極）Shizen Shigoku, you may find a feeling that fits with you. Can we touch this natural path? Can we connect with it in our arts and life? Of course. In fact we already are. we just need not block it, we must practice letting go, sutemi. Physically by releasing grips and techniques that are not working and mentally by not trapping ourselves in set ideas, thinking, and predetermined movement. And perhaps in a more humanistic way by parring away the unnecessary and rediscovering a more natural stance. Only when we can develop the sensitivity to let go, can we begin to move with the essence of the skipping stone. Feeling and sensing the grand power of nature flowing in, through, and around all. This entry was posted in Gokui on 10/10/2015 by Kasumi An Study Center.